Kusadasi's location at the centre of the Turkish eastern Aegean coast means that it is close to many important tourist attractions. The fascinating historical site of Ephesus is less than 30 minutes from the centre of town. The island of Samos in Greece is a short ferry ride from the port of Kusadasi. The beautiful Dilek peninsula is a short bus ride to the south and a few kilometres further is the ancient Greek city of Priene. Further afield, but well worth the trip is one of the most visited sites in Turkey. A must-do for Kusadasi visitors is the day trip to Pamukkale, the location of Turkey's amazing limestone hot springs. Trust us, take a day to visit the area and you won't regret it. A trip to Pamukkale will leave a lasting impression on you. Before we get into the travel details of how to arrive, let’s first talk about what is is. Pamukkale is a city is located in southwestern Turkey, known for its hot springs and travertines (terraces of carbonate materials that are typically a remnant of flowing water). The city is located in the River Menderes valley and it has a temperate climate for the majority of the year. This conveniently makes it an ideal destination for those wanting to escape the cold. 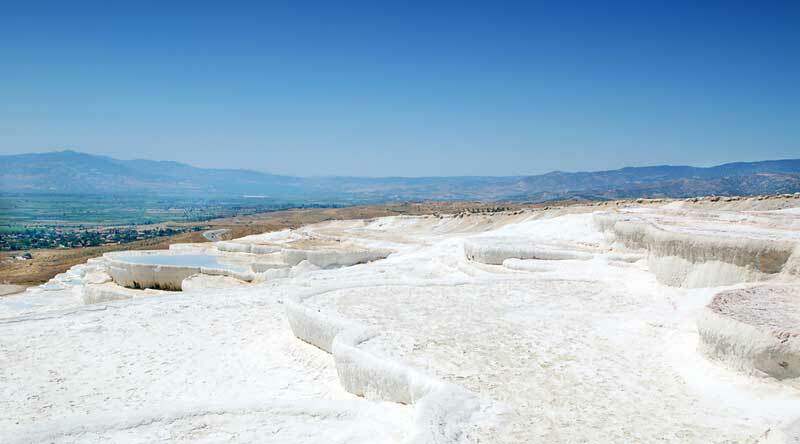 The main revenue generator for the town of Pamukkale is tourism. Tourism has, and probably always will be, the top industry. People have been coming to bathe in Pamukkale's thermal pools every year for the last thousand years. Hotels were built on the remnants of Hierapolis (located adjacent to the city of Pamukkale) which caused a lot of damage. Additionally, they build a road that connected the valley with the terrace so that motorbikes could go up and down the slopes. However, the area was eventually declared a World Heritage Site and they demolished the hotels and the road so that the area could be protected. In the total area, there are 17 different thermal springs which range in temperatures from 35 degrees Celcius (95 degrees Fahrenheit) all the way up to 100 degrees Celcius (212 degrees Fahrenheit), so some of the pools will not be suitable for swimming. Don't even get close to the hottest springs! Additionally, there is a museum in the city (that was originally a Roman bath) containing artefacts from all over the country (5 Lira entrance fee). Well worth a look. Try a dip in the sacred pool, where you can swim amongst roman columns, pillars, and remains of buildings and sculptures. This is one of the most popular places to bathe so don't expect the ‘healing' waters to be a tranquil space unless you visit out of season. The water contains high levels of minerals such as calcium and was used as a place of rest and recovery in ancient times. Expect to pay around 35TL to enter the pools. 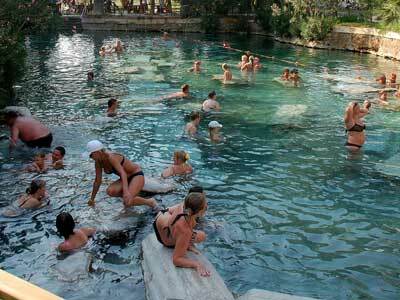 Most people will come for the travertine pools and the hot springs. Many will also visit the museum. But the area offers plenty of other interesting sites. For anyone interested in the history of Turkey, and the Roman/Greek/Byzantine societies that lived in this part of the world, there are hundreds of interesting things to see. The Temple of Apollo, nymphaeum, theatre of Hierapolis, Martyrium of St. Philip, and west and east necropolises are worth the trip for history buffs and culture vultures. There are enough restaurants in the area to satisfy the pickiest of tourists. Traditional Turkish food, and even Japanese food. Prices might be higher than you'd be used to in Kusadasi, Izmir, or Bodrum but most people will only eat one meal here during their day trip. Most readers of this blog will know about Kusadasi, one of the most important resort towns in all of Turkey. 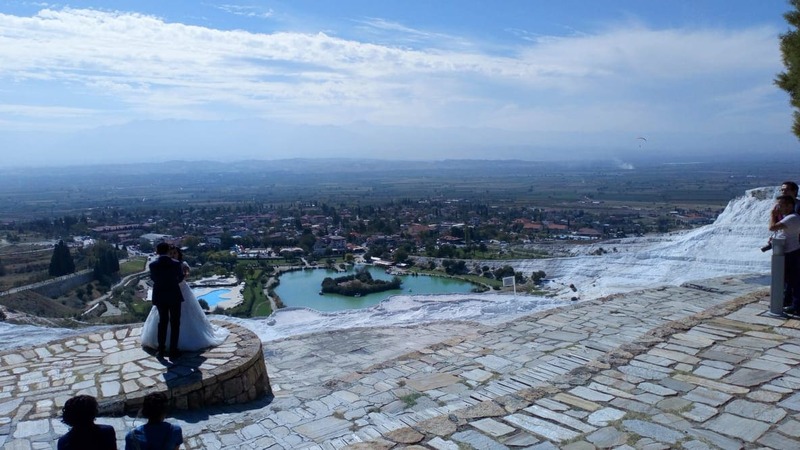 The town serves as a great launch point for visiting Hierapolis-Pamukkale. There are a couple different tours that you can take that will get you from Pamukkale to Kusadasi or vice versa. 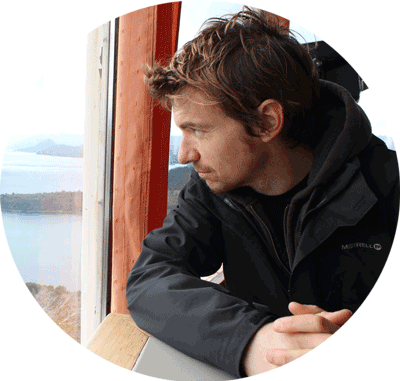 You can choose your tour based on how much time you are looking to spend on the tour. There are ones that offer daily trips while others offer trips that range anywhere from 2-4 days and take people to other places along the way to increase their viewing experience. 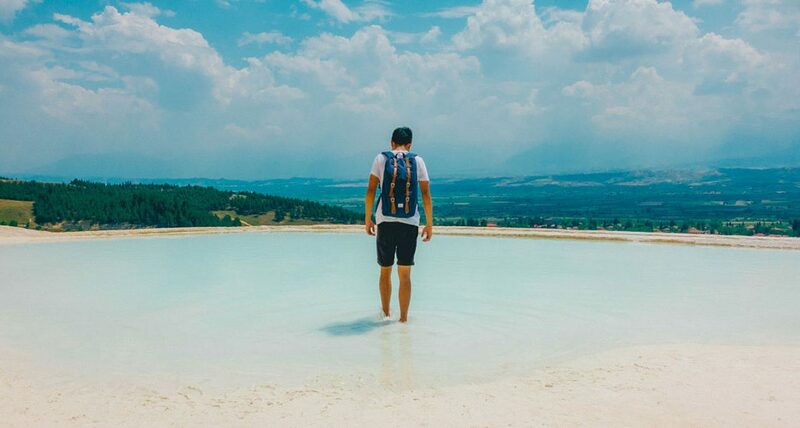 The full day Pamukkale tour from Kusadasi is perfect for anyone looking for a one day trip to explore the two cities and return back on the same day. The tour will leave early in the morning from your hotel and will bring you back later at night. There is also a two-day tour that leaves from Kusadasi and visits Pamukkale along with a couple other places. If you want to see more than one place and you have a couple days to spare, this is the tour for you. The team at No Frills Ephesus Tours offer a two-day experience visiting the ancient cities of Ephesus & Pamukkale. The tour leaves from Selcuk, but check with the organizers as they also do tours departing from Kusadasi. The aptly-named Pamukkale Tours company will pick you up from your hotel in Kusadasi in the morning, drive you to Pamukkale/Denizli, and guide you around the site for the day. Tours start at €39. Tour4Turkey has the highest rated tour of Pamukkale on Tripadvisor. 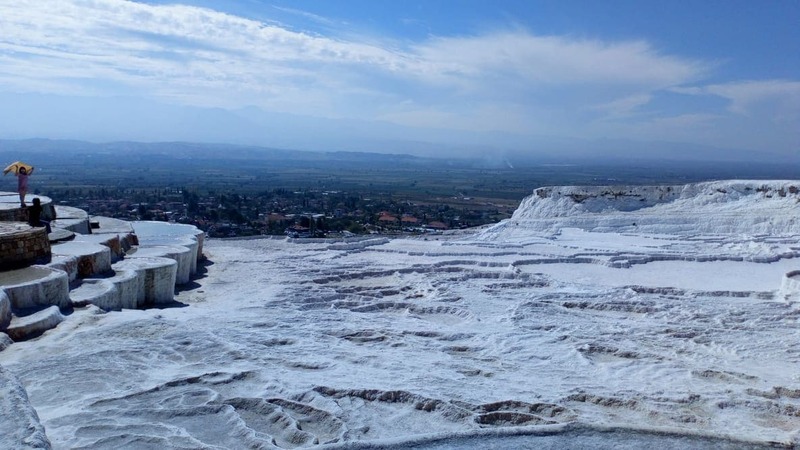 The trip departing from Kusadasi isn't heavily advertised and a little hard to find but their Pamukkale Day Trip From Kusadasi runs at €70 per person. The cost includes a buffet lunch and entrance fees to visiting sites. The Pamukkale Turizm company offer a nice bus route that runs all the way to and from Kusadasi. The bus leaves several times throughout the day so that you can easily find a time that works for you. This mode of transportation is the cheapest and easiest way to get to Pamukkale from Kusadasi. On the plus side as well, the trip between the two destinations is relatively short, so you can leave when you want and still have plenty of time to explore because you won’t spend a lot of time on the road. Additionally, the bus included wireless internet and TV so that you will always have something to entertain you throughout your bus ride. Hiring a private taxi is another option worth exploring. This will also be one of the more expensive choices but gives you a great deal of flexibility. TaxiKusadasi will get you from Kusadasi to Pamukkale in 2.5 hours. The cost is €185 for Kusadasi-Pamukkale and Pamukkale-Kusadasi. Shared among 4 people this might be a valid option. Hiring a car will give you the most flexibility and greatest options. Want to beat the crowds? Set off early and return late. Want to stay longer than the scheduled amount of time? No problem. Fancy taking a more scenic route back to Kusadasi or heading back via Ephesus? Hiring transport will allow you the freedom to make up your own itinerary. Try Avis in Kusadasi for good, reliable service. Hiring a basic 4 seater will set you back around €35/$40 a day. Even after adding the cost of fuel it can be a very economical way of travelling around. You must be at least 26 years old to hire a car. Expedia is one of our favourite flight and hotel companies. But they also do car hire. We haven't yet tried Expedia but if their support service is the same as they usually provide then we'd highly recommend trying them out. Expedia runs through various options and gives you the best ones listed based on your selection criteria. We've found cars for as low as €27/$25 a day. If you go in July or August, bring sunscreen, a hat, and light clothing that covers the skin. It's hot at this time of year, with average temperatures just below 40C (104F). The sun reflects off the white calcium deposits and the water of the travertine pools making the sun's ray even more intense. Temperatures from November to March are mcuh more reasonable, hovering below 20C. It's a better time to visit if you don't like the heat. Expect sun at any time. As you can see, there are plenty of great things offered by each of the cities, so it is easy to see why you might want to visit both of them if you happen to be in the area. Fortunately, thanks to the easy connection between the two cities with a bus or a tour or any other form of transportation, you’re going to be able to travel quickly and efficiently between the two cities. Sunscreen, hat, long-sleeved shirts are essential as you will probably arrive when the sun is at its strongest. Ignore the hagglers at the entrance to any site. They won't be able to offer you better value for anything. Watch your belongings. Pickpockets understand that 99% of the people in the area are tourists who are distracted by the amazing views. I loved my trip to Pamukkale. Your post reminded me of great memories from a few years ago. For those who stay for the night, the sunset was amazing. The place was almost empty and the colour contrasts looked fantastic. we’re planning on going in February any idea how crowded it will be? Also it sounds like we can get a room at that hotel get up early and just go for it no tour guide needed? ✈ This is a well-informed post.